Putting technology to work so you can catch more fish! Hello and thanks for visiting OverBoard Industries! This marks the dawn of a new era, as we at OverBoard Industries are truely commited to bringing new and exciting ideas into the fishing world. Our mission is to bring top notch products using the best available technologies into your hands, designed to improve your fishing experience...and of course your catch! Our first mission is to bring a convenient and effective means to charge your glow lures to the market. Which we have done with the ChargeBox - THE best way to charge your glow lures (and paddles) using UV technology. All OverBoard Industries products are MADE IN THE USA! Over the weekend of July 23rd and 24th OBI visited New York for the Little Salmon River Challenge at Mike's Marine. During the raffle following the tournament a couple of ChargeBoxes were given away. 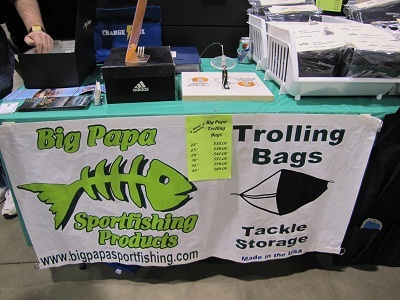 We also setup a table at the tournament and met quite a few of the folks both fishing in the tournament and helping to run it. We encourage anyone in the Little Salmon River area to visit Jon's Little Salmon Bait and Tackle as they run a first rate operation. They are also carrying the ChargeBox so stop in and see it! 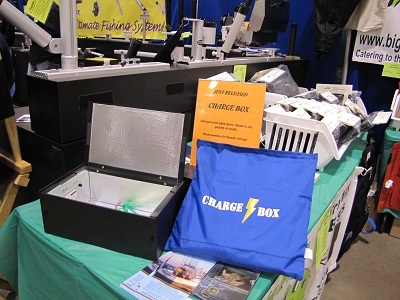 The weekend of January 15th the ChargeBox made it's public debut at the Ultimate Fishing Show in Novi Michigan. Big Papa Sportfishing http://www.bigpapasportfishing.com (check out their site for all kinds of big lake tackle) introduced the ChargeBox in their booth. Have a look at the photos below showing the ChargeBox in Big Papa's booth. 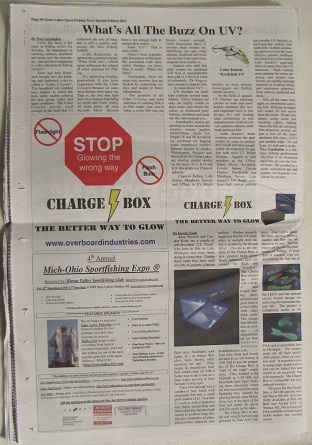 Thanks again to Big Papa for getting the word out about the ChargeBox! The GLSFN was kind enough to write an article introducing the Great Lakes fishing world to OverBoard Industries and the ChargeBox! Please pick up a copy of the GLSFN at your local tackle store or fishing show and look for our article on the next to last page. Thanks again to Dennis and the crew at the Steelheaders for the great introduction of the ChargeBox! Be sure to check out the Steelheaders web site at http://www.michigansteelheaders.org and support their organization as they work hard to protect and promote our treasured salmon and trout fishery. 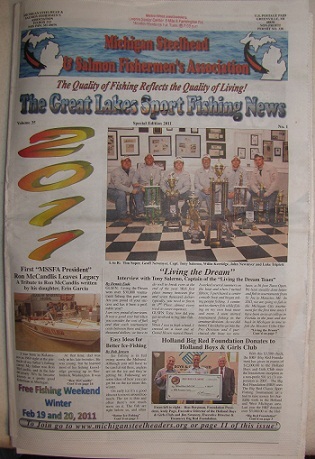 The GLSFN front page and OBI article.